The Ongoing military exercise across Benue, Kogi, Nasarawa and Taraba states has started yielding positive reports in no small time, a group identified as Middle Belt Patriotic Assembly has said. At a press conference to evaluate the exercise that was recently launched by the Chief of Army Staff, Lieutenant General TY Buratai to tackle the menace of herdsmen/Farmers clashes, Armed banditry and cattle rustling across the state. The group however noted that while the army is making concerted efforts to rid the region of killer herdsmen, some politicians are making attempts to drag the Army into politics which he said is beyond the scope of exercise AYEM AKPATUMA. According to Frederick, Nigerian Army remain apolitical and true to its mandate at all times. He urged individuals, especially the Benue State and Adamawa state governments to set a good example by not dragging politics into security issue. According to him, all stakeholders must understand that the military as a national institution doesn’t yield to individual concerns of political actors but that which benefit the overall interest of the country. 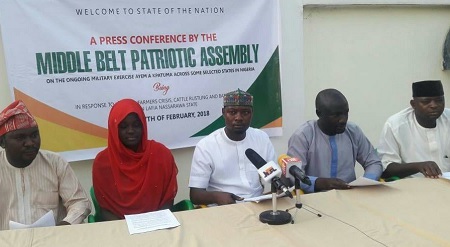 He said, "Whereas the Governor is free to make his statement anywhere in a democracy, the Middle Belt Patriotic Assembly considers the comments as a clear breach of the constitution and an attempt to drag the Nigerian Army into the politics surrounding issues between herdsmen/Farmers in the State. "We therefore wish to warn the Benue State Governor to spare the militrary of any interference in the internal affairs of the State whilst allowing the Army to concern itself strictly with the Exercise Cat Dance which was inaugurated to flush out criminal elements from the State. "There is no doubt that the exercise is already yielding its desire goals as conceived by the Chief of Army Staff, Lieutenant General TY Buratai and is being carried out by troops patriotically." Frederick said after their assessment, it came to the conclusion that the military is doing a good job in Benue State and other parts of the country where “ Exercise Cat Race “ is currently taking place. He said Nigerian Army exercise should be supported to achieve the desired goal which will be beneficial to the entire country, stressing that the Nigerian Army under Lieutenant General Buratai has remained apolitical andr can do without political distractions.